Arthroeresis is defined for the foot as a limitation of movement across the subtalar joint. The implant is designed to help “re-associate” the foot with the ankle and leg during weight bearing. It is a small titanium implant placed through a very small incision on the outside of the foot. The implant lifts the talus and prevents the talus from dropping “down and in”, which causes the heel and the rest of the foot to turn out and flatten. This procedure essentially stops excessive movement of the ankle and leg on the foot and lessens the degree of flat foot deformity or pronation. What is the function of the foot? It is important to understand that the foot and leg are connected by a bone in the ankle called the talus. The talus is a torque converter that allows movement in the foot to translate to the leg and the leg to the foot. All the foot bones are connected together by ligaments. The talus above the foot can drive the foot into the ground by causing it to flatten or pronate. The foot has two primary functions. The first is to act as a “mobile adapter”, which means that when the foot hits the ground the foot can pronate or roll in and absorb shock. This is very important when walking on any uneven surface. It is also important to allow the foot to absorb shock so that stress is not translated above to the ankle, leg, knee and spine. The second function of the foot is to become a “rigid lever” during gait so that when the heel lifts up, the foot locks and push-off becomes strong and efficient. What is a flat foot or a foot that excessively pronates? A flat foot occurs when the ligaments holding the bones of the foot together are excessively loose. When the foot hits the ground the arch collapses or pronates and unlocks, thus allowing the body to absorb shock. When it is necessary to supinate or lock the foot, the arch remains in a collapsed or pronated position and cannot effectively lock in push-off. A flat or pronated foot is best understood as a “dis-association” of the “foot from the talus, ankle and leg”. An arthroeresis blocks the excessive joint motion (pronation) and allows the foot to not only function as a mobile adapter when it hits the ground but also locks the subtalar joint to allow it to become a rigid lever and provide effective push-off during gait. What is the primary cause of a flat foot? Excessively loose ligaments in the arch. Usually hereditary and is very common in families. Can be caused by trauma to the tendon on the inside of the ankle and foot called the posterior tibial tendon. This trauma can weaken the tendon so that it would not provide dynamic stability to the arch and foot. This is commonly referred to as “posterior tibial tendon dysfunction”. Trauma or excessive stress and stretch to the ligaments on the inside of the ankle. These ligaments are called the spring and deltoid ligaments. Abnormal bone connection of two bones in the foot called a “tarsal coalition”. This creates a rigid flat foot. Abnormal bone structure which does not allow the tendons to function efficiently during gait. Underlying neurological or genetic conditions should be ruled out as flat feet are common in children with cerebral palsy and Down’s syndrome. Tight calf muscles may significantly aggravate a flatfooted child or adult and make the condition far worse. What are the signs of a flat foot? The arch is low or even flat on the ground when the patient stands. When the foot is off the ground the arch may appear to be normal. When looking at the child or adult from behind, the heel bone turns out and there is a bony bulge on the inside of the foot just below the ankle. This is indicative of a collapsing foot. The inside of the foot looks convex and the outside of the foot looks concave. When watching the patient walk from behind, you can see many of the toes as the foot points out or pronates. The more toes that can be seen, the greater the problem. There is a poor ability to push off during walking. It is even more apparent during running as the child, teen or adult runs with the foot pointing out and unable to properly push off. Running looks awkward. The patient typically does not stand correctly. There is a weakness to their stance and their feet generally point outwardly. The child or teen generally walks more clumsily. There may be an early development of hammertoes and bunions. The front part of the foot is turned out relative to the back part of the foot. Knock-knees are very common in young children who are flatfooted. The child, teen or adult just does not walk or run correctly. both feet were surgicall repaired with the arthroereisis implant at seperate times. foot and elevating the arch. Patient currently no longer has pain and is able to keep with her peers with activities without fatigue. What are the symptoms of a patient with a flat foot? Very early in childhood, toddlers typically experience fatigue with walking or standing. They do not complain of pain but their fatigue causes them to ask their parent to be picked up frequently. They enjoy being in a stroller more often. As a child gets older and attempts are made to begin to play sports, the child who is flatfooted typically runs slower and looks more unathletic than their peers who have a better foot posture. They usually develop fatigue prematurely and will typically not enjoy the activity as much as the kids who are not flatfooted and run more correctly. They begin to do more sedentary activities. Leg pains are often present, especially at night at the end of the day’s activities. These are “NOT GROWING PAINS”. Inner leg, ankle, knee and lower back pains are very common. Heel pain or plantar fasciitis are often felt. Heel pain or Sever’s in children is very common. Kids that play baseball will have a difficult time getting out-of-the-box after they hit the ball. Kids that play basketball will have a more difficult time with their first step dribbling and going to the basket. Defense becomes more difficult as they try to get to the area the offensive player is going to and are unable to do so. Kids that play soccer will not have the quick ability to dribble past the defender or to defend when an offensive player quickly tries to get by them. Kids that play tennis will have a difficult time getting to the ball when a shot is hit away from them. It is seen even more when a player has a poor ability to return a fast serve. 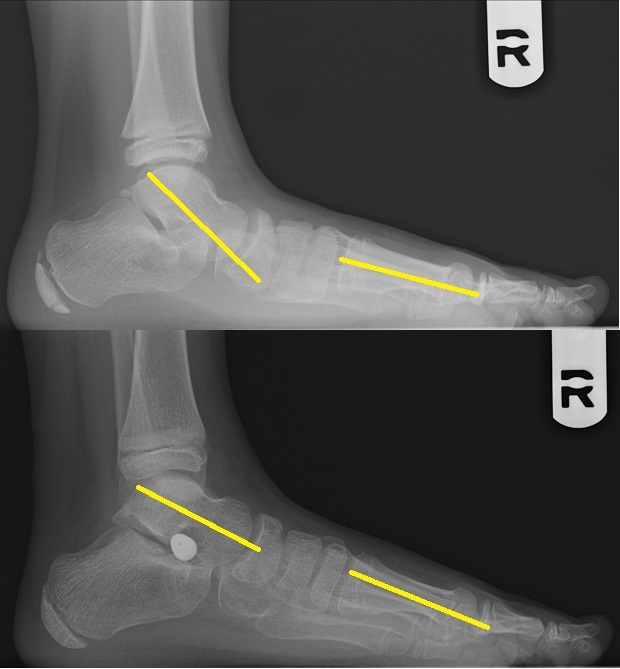 How is the patient with a flat foot evaluated? A thorough birth and family history is taken of the patient. We attempt to determine who in the family the child most resembles from a standing, walking and running standpoint. How is their family member’s general body type and how have they performed as they have gotten older. We then want to determine if there is a correlation to how that older family member was functioning at a young age as well. In children, we want to know when the child began to crawl, stand and walk. We want to determine how the patient is functioning from a walking, standing, running or general exercise standpoint. Are they clumsy? Do they run with their feet pointing out and generally appear uncoordinated? Are they slower and less active than their classmates and peers? We want to understand how the child SITS AND SLEEPS to determine if there are problems that could perpetuate the deformity. We evaluate the patient most commonly in a supine position (lying on their back) on the examining table. We evaluate range of motion of the hips, knees, ankles and foot joints. We look for any soft tissue or bony abnormality that could cause or at least aggravate the underlying condition. We evaluate the position of the knee relative to the head and neck of the femur to rule out rotational problems of the femur bone itself. We also evaluate the position of the end of the lower leg bone called the tibia relative to the upper portion of the bone. We want to be sure to rule out external tibial torsion, which is extremely common in patients who are flatfooted. Muscle strength and flexibility is evaluated to check for areas of weakness or tightness to the foot, ankle, leg, knees and hips. We evaluate for instability of any joint to the lower extremity and hip. Is there something that is out of place or not moving as it should? In flatfooted kids their midfoot is usually very unstable and unlocked. We call that “midfoot instability”. Patients are then evaluated while they are standing. A scoliosis screening is performed. The height of the pelvis is examined to check if the right and left iliac crests are of equal height. We will look for the position of the knees and kneecaps. Are they turned out or in? Does the patient have knock-knees or are they bowlegged? Is there bowing of the tibia or femur? Is the ankle turning in or out? Do the ankle bones point in the correct direction? Where is the foot pointing? Is it straight, slightly pointed out or excessively pointed to the outside? What is the height of the arch? Is it lower or does it touch the ground completely? Is the heel bone turned out and not aligned with the tibia, which is the lower leg bone? Are they parallel to each other when looking at them from behind? Is there a bulge below the ankle on the inside of the foot? Are the toes crooked and shifted to the outside? Do the legs and feet look symmetrical on the left and right side? Patients are then evaluated while they are walking down the hall in our office. How does the heel and foot strike the ground? Is the heel turned under, is it straight or is the heel bone turned to the outside? How many of the toes can be seen while you are watching the patient walk away from you and you look at them from behind? Is there a proper weight transfer going from the heel towards the outside of the midfoot and then transferring the weight towards the big toe with push-off? Does the foot load correctly and prepare for push-off or is the foot position poor, causing a mechanically unfavorable position when the foot is ready to push off? Where do the kneecaps point during walking? Do they squint and point in, point straight or appear to be pointing out? Is there symmetry of the right and left leg in gait and is the foot pointing in the same direction on both sides? Does there appear to be a normal balance in the patient’s gait or is there a premature heel lift indicative of a tight calf muscle? Does there appear to be a limb length discrepancy where one leg is longer than the other? Is the hip dropped more on one side than the other? Does the height of the pelvis appear to be equal on the right and left? Is the shoulder height symmetrical right and left or does it appear that one shoulder is lower than the other? Does the gait look natural or does it appear abnormal? Patients are then evaluated while they take a light jog down the hall in our office. Again, we look for heel strike and weight transfer to the ball of the foot. We check if the patient is effectively pushing off with the foot in the correct position. The foot progression angle (where the foot is pointing) is evaluated, as this becomes more exaggerated in a flatfooted or pronated patient. Full weight bearing x-rays are taken with the patient fully weight bearing to evaluate the bones in the foot and their position relative to each other. Angles are drawn to evaluate where the fault lies and if surgery is necessary, where it is best performed. X-rays are taken in this full weight bearing relaxed position. Other x-rays are taken with the foot is manipulated into a neutral position to be sure that the foot has the flexibility to be restored back to a better posture. In this neutral position we evaluate the first ray, which includes the first metatarsal and medial cuneiform. An elevation of the first ray while the foot is in neutral position gives us an idea of whether or not a procedure needs to be performed to restore the “tripod” on the inside of the foot. X-rays of the ankle are always taken to rule out ankle valgus. Ankle valgus occurs when the growth plate at the end of the tibia (lower leg bone) gets stressed on its outside and fails to grow symmetrically to the inside portion of the bone. The ankle then grows tilted in and this can be a permanent problem. X-rays are also able to be evaluated to rule out a tarsal coalition, which is an abnormal connection of two bones. MRIs are often necessary, especially in adults, to evaluate the bone marrow and to get further insight into the cartilage and the rearfoot and midfoot joints. 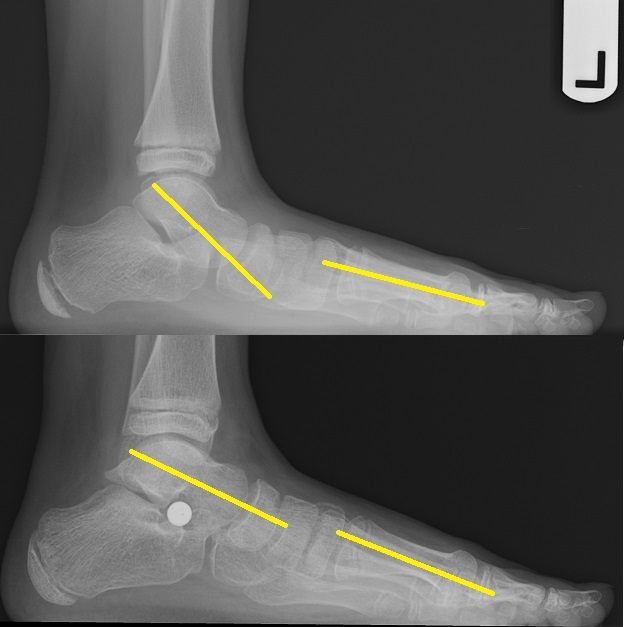 In adults with longstanding flatfoot deformity, abnormal stress may have taken place, which would preclude a reconstructive procedure which would include an arthroeresis. CT scans are often necessary if a tarsal coalition (abnormal connection of bones) is suspected. It is also utilized to evaluate joint surfaces in the ankle and foot, which may change the types of procedures that are necessary to nonsurgically or surgically treat a flat foot. Once all the information is gathered a treatment plan is individualized to a patient. It is important for us to know what is important to the child, teenager or adult and their family. Is there a concern with the patient’s body weight, heart health, ability to exercise or general ability to participate in activities with their peers? Is the patient or family trying to avoid some of the physical limitations that other family members have had? Is there a self-esteem issue with the child or teenager? If the child is not playing or participating in sports with their peers they may get down on themselves. Is there a concern about the child’s gait? For example, a child that is excessive pigeon-toed or out-toed is concerning to parents, as they gait looks abnormal. This concern is worse for girls than it is for boys. Once we gather all this information and understand the issues that are important, we will put all the information together and do what is best for the patient. It is important to first address how a child sits and sleeps, as certain postures may perpetuate an abnormal gait. For example, in a patient who is excessively out-toed, sleeping on the belly perpetuates the deformity. This is because the feet and legs continuously point to the outside and the muscles in the hips get excessively tight. Physical therapy is often necessary to improve a patient’s gait by teaching exercises to improve lower extremity flexibility. It is also useful to help stretch tight joint structures and muscles and to help improve overall lower extremity flexibility. Core strength is very important and there is always a focus on strengthening the lower back and stomach muscles. Evaluation of the gastroc soleal muscle (calves) is one of the most important things we do on our exam. If the calf muscle is tight, conservative treatment with just an orthotic would likely fail. In that case, it would be important to cast the lower extremity from just behind the toes to just below the knee. Any attempts at conservative treatment including making an orthotic for the shoe will fail if the muscle is tight and not stretched. Serial casting is a procedure that is performed in our office one leg at a time. The extremity is placed in a cast with the foot in its proper position and a non-removable cast is applied. The patient needs to walk as much as possible to help improve the calf muscle flexibility. The more walking the patient does, the more flexibility will be achieved in the muscle. This could take 2-6 weeks. Once the cast is removed, a night splint may be utilized to maintain the loose muscle. An orthotic is then made to have more permanent support of the arch. We then address the other extremity by casting it, if necessary. In some cases conservative treatment fails and surgery will be necessary to give the child, teenage or adult an opportunity to live life not only pain free but more fully with the ability to participate in sports activities with their friends, classmates and family members. It is important to understand the natural history of some patients with their flat foot. Flatfoot is not an entity all by itself and there are many factors that make the condition worse. It is easy to predict who is going to have more of a problem as they age. If there is a tendency for this problem to get progressively worse, then surgical treatment should be initiated if conservative treatments failed. In MILD TO MODERATE cases that have failed conservative care, an arthroeresis can be performed alone. (Lengthening the Achilles Tendon or lengthening the Gastroc Muscle is an excellent start. We will most often place an implant in the sinus tarsi at the same time to give the foot stability and create an arch.) This is called an “arthroeresis” procedure. The goal of this implant is to lift the talus and prevent it from dropping down and in. Once the talus is lifted and placed in its proper position, the heel bone and the rest of the foot are able to come back under the leg and realign itself to a proper position. The implant used in an arthroeresis blocks abnormal or excessive talar motion relative to the rest of the foot. This helps to correctly realign the foot and remove any midfoot instability that is almost always present and problematic in a flat foot that necessitates surgery. 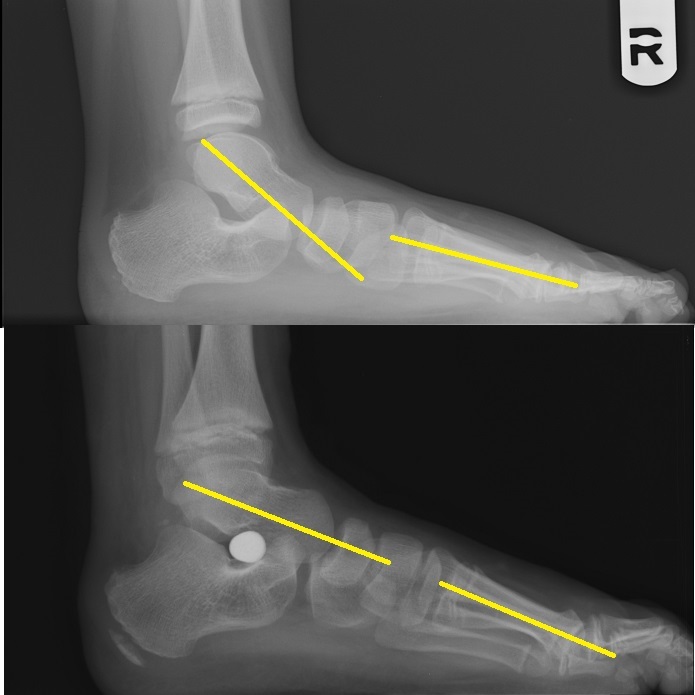 In some cases an arthroeresis procedure is not enough to get full correction of the flatfoot deformity. In those cases we may perform one of two procedures at the same time. The two procedures commonly performed (implant and lengthening of the tendon) are done on an outpatient basis under a twilight or general anesthetic. The procedure is usually performed with four small incisions approximately ¼” in length. One incision is on the side of the foot just below the ankle and three small incisions are placed over the Achilles tendon. 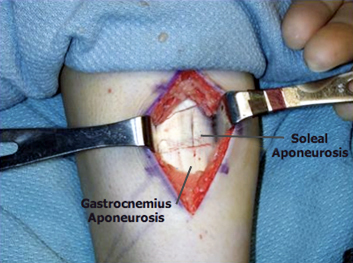 A cast is applied postoperatively for six weeks to allow the Achilles tendon to heal. Crutches are necessary for six weeks. Patients are then placed in a walking boot and start physical therapy to rehabilitate the foot, ankle and any other problems of the lower extremity that are aggravating the underlying condition. There is little to no pain postoperatively and an excellent outcome is expected. With these two procedures no bridges are burned so in the future if other surgical procedures are necessary they can be performed. We have had excellent outcomes in patients with mild to moderate deformities. In lieu of doing a lengthening of the Achilles tendon, a small procedure called a “Gastroc Recession” can also be performed with the implant in the foot. 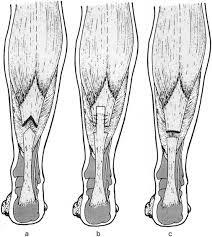 This is performed with a 1.5” incision just below the calf muscle. The gastroc aponeurosis, which is an extension of the calf muscle, is lengthened and the foot is able to achieve its motion in the ankle joint instead of the foot getting excessively loaded. This procedure is also performed under a twilight or a general anesthetic. Nonweightbearing is necessary for 4-6 weeks followed by physical therapy and a walking boot.